Roger went to our favorite Patriots "Bah". It's all people from New England and they all sound like me! Plus, I have commissions to work on! 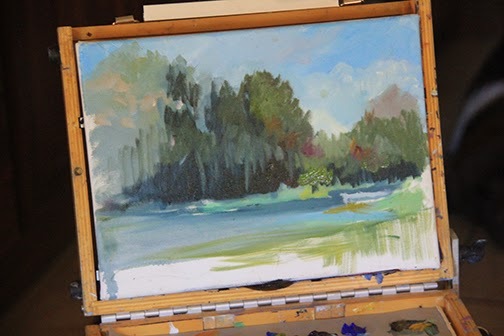 Worked a bit more on my plein air piece of the Lake here. Told myself I needed to just do it and started mixing my greens darker. Greens are my bugaboo. In art school we were told never to use black but come to find, the Munsell method, black is our friend. I mixed some Chroma Black with yellow and then adjusted with blues and a bit of white to get what I liked. I'm looking forward to working on it outside tomorrow! 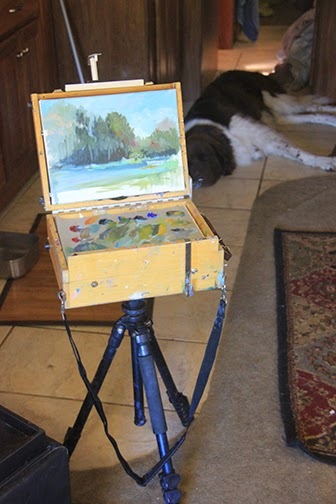 I am also going to get out my other two plein air boxes. Thankfully I brought them with me. 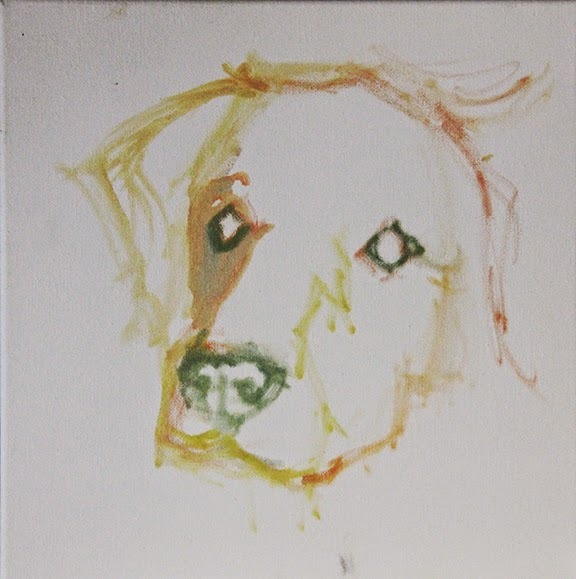 This one you see is good for my copper panels and I think my other would better suit stretched canvas. If all goes well we plan on doing an outing with the kids tomorrow to a "dog park" near Smyrna Beach. At first I said a no to the dog park idea until Roger told me it was actually half an island. Trails and a beach access with places to stop and picnic. The dogs stay on lead as we investigate, plus Roger is itching to do some photography! Awhile ago I figured out our mileage for our first adventure! 1,226.1 miles.! We survived!! Right now in Florida it's still hot and I see Georgia is low 80's high 70's. Soo tempting. The weatherman on tv last night assured me however colder air is coming. Time to do the Sunday housework. Have a great rest of your day!! The island sounds like fun... Looking forward to photos.